I'm currently playing a test game using the BM v1.20 alpha that I started last week. I've been keeping notes turn to turn and thought it would be fun to post snippets of the action here. I'm playing the Xiati Empire approximately to "script". I started with a lot of tech points so I could start lower mid tech as progress will be very slow afterwards with high cost and the limited number of colonization targets. The Xiati home system is Xiria - a binary star system with only 4 planets. Xiati Prime (Xiria IV) is a large rock oxygen planet with a hazy orange atmosphere and a few small continents. Recently coming to power, Emperor Tax'Renath has pledged to expand the Xiati beyond the Xiria system with the recent discovery of warp points leading to other systems. To facilitate the creation of an interstellar empire, top Xiati engineers develop new star ship designs. The key designs are the Forager class scout ship, large colonizer ships that can found new colonies on rock and ice worlds, and a large space yard complex to supplement ground base construction yards. Space Yards on Xiati Prime begin building the first of 4 Forager class scouts. Their mission is to explore the 4 warp points leading to the nearby star systems of Lacerta (N WP); Orion (S WP); Dvoongar (W WP); Eskirk (E WP). Ships exploring north, east and west of Xiria have little success. Planetary systems Lacerta, Eskirk and Drax have no colonizable planets. Dvoongar is a nebula and two more connected systems are black holes: Praxis and Veridian. The construction of the first orbital SY (Xiati Prime SY) in 2400.7 provides increased construction capacity. As the first colonizers are constructed with orders to colonize the Orion system, an additional 4 Forager class scouts are ordered. By 2402.0, additional colonization targets have been found south of Xiria in the Obotron (Obotron I) and Talara (Talara V) systems. The three breathable Orion planets have been colonized (Orion II > Research Compound, Orion IV > Mining Colony, Orion IX > Research Compound) and new facilities are under construction. A total of 8 Forager class scouts have been constructed. Ships exploring north/west/east of Xiria continue to few useful systems as Quesstris (neutron star) is empty and Yullado and Yoshri offer no colonizable targets. During 2402.0, Forager 0002 warps into the Fwandrei system (the W WP of Obotron) where it views a high populated colony of the EEE Consortium - possibly a homeworld. Forager 0002 is ordered to fall back to the Obotron WP to hold the system for Xiati Empire. Although no combat has occured, Xiati engineers propose a new ship design, the Raptor class, more heavily armed to potential deal with the EEE and whoever else might be out there. The next 20 turns featured a lot of expansion and a number of successive first contacts. With increased urgency after encountering the EEE Consortium, additional colonization targets are uncovered in the Ootoola system (Ootoola I, O2 Ice M); Utekra system (Utekra I O2 Rock H, Utekra IV 02 Ice M); Lezzari system (Lezzari I, 02 Rock M); Fezzran system (Fezzran II, 02 Rock M); and Sirius system (Sirius II, O2 Rock H). It turns out the quadrant is teeming with intelligent life, much to the chagrin the xenophobic Xiati Empire. - Forager 0007 surveying in the far north, spots a ship and minor colony of the Jraenar Imperium in the Rhendor system in 2402.4. - Forager 0001 surveying in the west, Fezzran system, uncovers a ship of the Cue Cappa Commonwealth ini 2402.5. - Forager 0007 still in the Rhendor system spies a small ship of the Phong Confederation in 2402.6. - Forager 0008 in the far south, surveying the Reticulum system, spots a ship of the Ukra-Tal Collective in 2402.6. - Forager 0001 exploring the Sirius system, spots a ship of the Sergetti Empire in 2403.5. Wanting nothing to do with the various aliens encountered - the Xiati Empire quickly completes Non-Interference Agreements with the Jraenar, Phong and Sergetti. Deals with the EEE and Cue Cappa remain elusive. With the rapid expansion of the Xiati Empire, Emperor Tax'Renath pushes the treasury to its limits. Organics run low, but Radioactives are almost completely exhausted (just 3kTs left!) before several Radioactive Refining Facilities are constructed in the late 2403s. The general indifference of the Xiati population and low growth rates don't help to say the least. At least Minerals are plentiful. Noting the Fwandrei system as the home system of the EEE, Emperor Tax'Renath orders a combination of Forager and Raptor class ships occupy warp points (Obotron-Fwandrei, Utekra-Fwandrei) to prevent EEE ships from moving north into Xiati claimed space. In 2403.6, Forager 0001 is holding colonization target Sirius II awaiting the arrival of a colonizer. 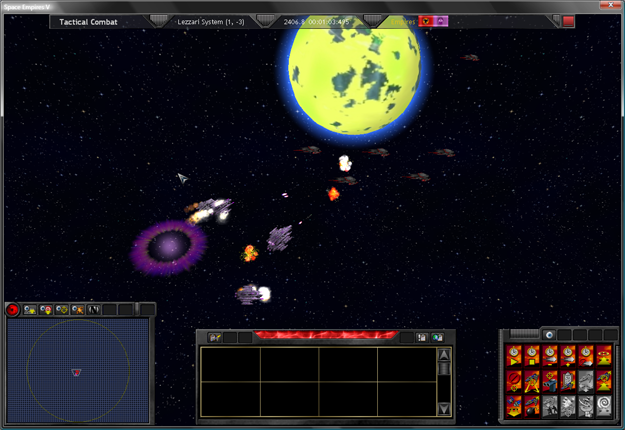 A colony ship of the Cue Cappa arrives first and Forager 0001 attacks the unarmed ship. Unfortunately Forager 0001 moves in too close and is struck by the colony ship which was apparently on a collision course. The colony ship is also consumed in the explosion. The loss of the Forager 0001 sends waves through the empire. In 2403.9, the recently founded colony of Fezzran II is attacked by 4 ships of the Cue Cappa Commonwealth, including what appears to be a light cruiser. The colony, which has yet to construct any defenses, is caught off guard by the attack and is completely destroyed. 67M are killed. Due to the extreme lack of colonizable planets and extremely long supply lines, all efforts to hold systems directly N of Xiria are abandoned. A few Forager class ships remain to monitor potential Jraenar or Sergetti activity of which nothing has yet been seen. Estimates indicate many of the known empires hold at least a similar amount of territory as the Xiati, if not more. Rumours have the Jraenar holding much of the north with many ships and the Cue Cappa hold many systems to the southeast. Even the EEE, seemingly contained in the Fwandrei system, probably have significantly resources further south. Between 2404.0 and 2405.0, much of the Xiati effort has been to secure and build up their existing colonies. As of 2405.0, the Xiati Empire consists of 12 planets and has a population of 5,396M. This puts the Xiati Empire somewhere in the middle in terms of empire size compared to the other known empires. Directly south of Xiria, this system has become a significant production center with 3 major colonies. 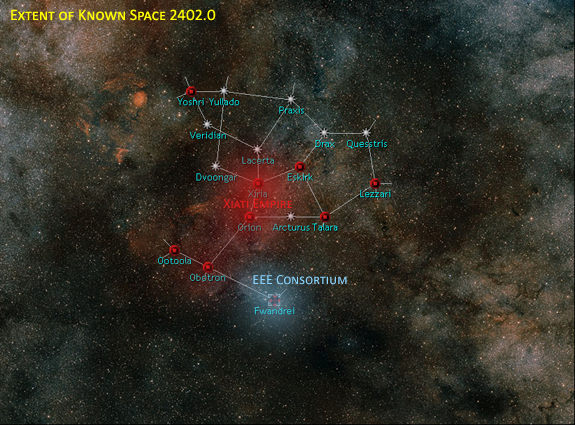 South of Orion, the Obotron system has only one large colony, but is a major crossroads system, including a contested link to the EEE's home system of Fwandrei. 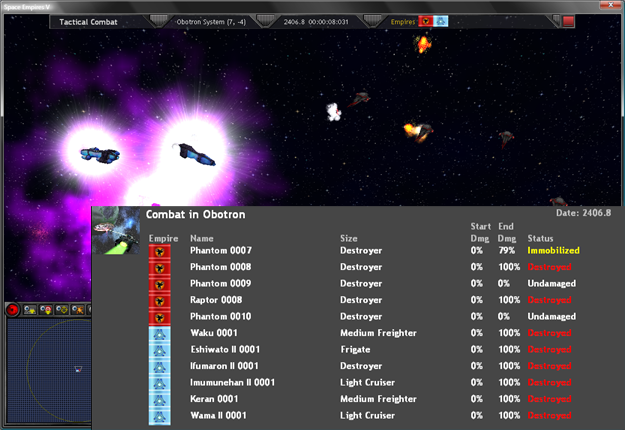 Multiple combats with EEE ships have now occurred at the Obotron-Fwandrei WP. NW of Orion, the Ootoola system is a key economic contributor for minerals and radioactives. It's western WP to Drepana is currently unsecured although the colony has recently completed key defensive units that should provide protection against most assaults. This recently colonized system (2404.2) is one system removed from Ootoola and is considered a frontier system. Multiple Forager class ships have stationed themselves at the planet. Fornax is at the doorstep of the Phong Confederation and Ukra-Tal Collective. The Reticulum system is the southernmost system of the Xiati Empire and only under partial control. Reticulum IV (colonized 2404.3) to date has only constructed defensive units and a pair of Forager class scouts remain in orbit. 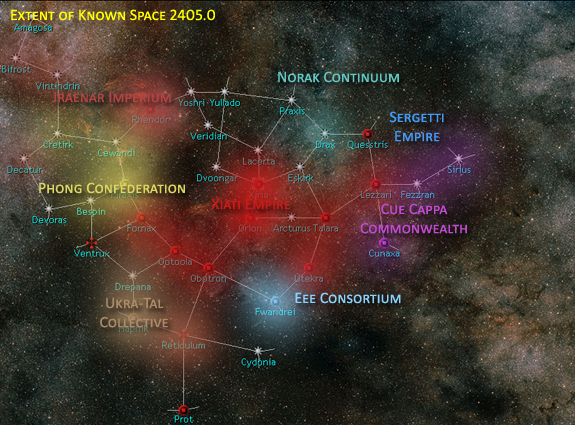 A Ukra-Tal colony was discovered on the opposite side of the system. With the adjacent Haphik system discovered as the home system of the Ukra-Tal, this system will be hard to hold on to if war breaks out. 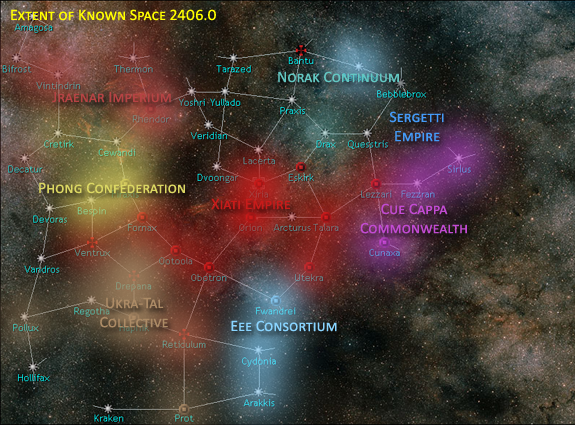 With two major colonies, Utekra is the second most significant colony system after Orion and is directly northeast of the EEE's Fwandrei system. A group of Forager, Raptor and Phantom class ships currently secures this warp point from incursions. 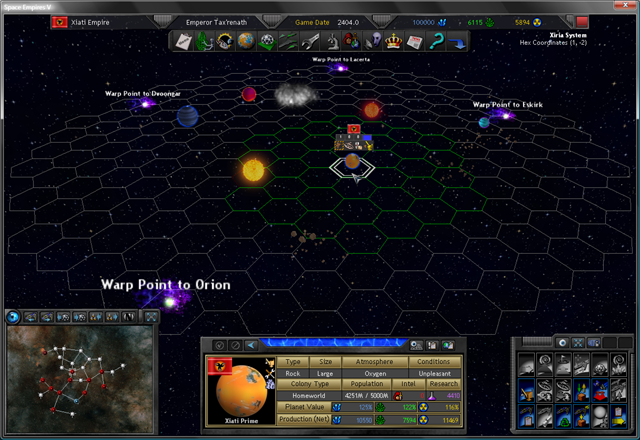 The Talara system is one system removed to the east of both Xiria and Orion. Talara V is a major research center. The Lezzari is the furthest eastern system held by the Xiati empire. 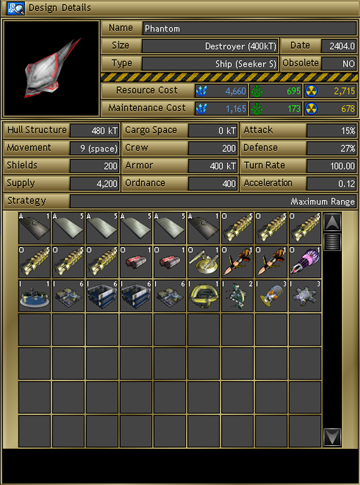 Lezzari I remains under heavy development with extensive defensive systems just completed. Heavy Cue Cappa activity in the former colony system of Fezzran to the east has led to Emperor Tax'Renath deploying additional Raptor/Phantom class ships to Lezzari to protect against future attacks. The last year has seen limited interactions with the other known races as exploration and scouting activities have slowed in favour of securing existing holdings. Since Emperor Tax'Renath has abandoned efforts to re-colonize Fezzran, no encounters with the Cue Cappa have occurred. 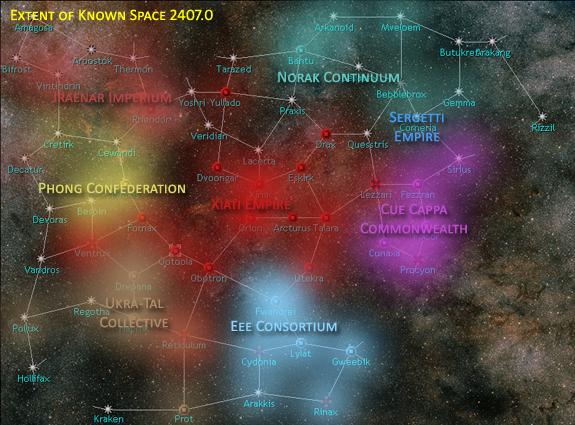 Efforts in the Lezzari system are being made to close off the west to Cue Cappa expansion and protect the core systems of Xiria, Talara and Utekra. Two EEE incursions have been repelled at the Obotron-Fwandrei WP by the 3 ship force of Forager 0004, Raptor 0001 and Phantom 0001. 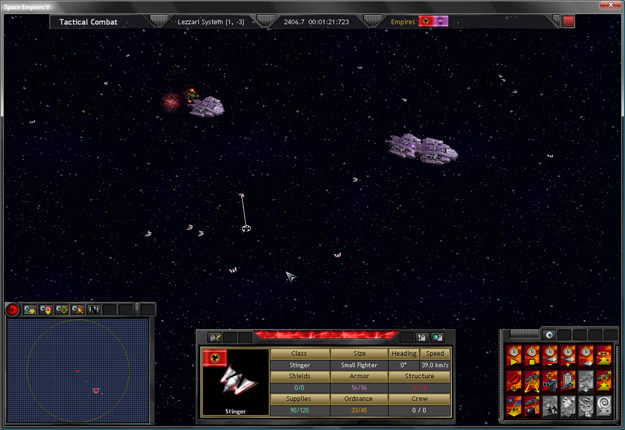 An EEE colony ship and EEE destroyer were destroyed without loss. The Phong have appeared friendly but the Emperor Tax'Renath does not trust them at all. Despite this, he recently exchange system maps with the Phong in an effort to gain a better understanding of the western region of the quadrant. The Phong Confederation is thought to hold 4 or 5 systems directly and the northwest seems to be the exclusive domain of the Jraenar Imperium. Forager 0003 on route to complete the survey of Quesstris encountered an unarmed explorer of the Norak Continuum in 2405.0, which it destroyed without damage to itself. Surrounded by hostile alien powers, Emperor Tax'Renath has pledged to build up Xiati naval assets to forcefully close off Xiati space to other races. As the economy recovers and construction queues become available at some of the colony worlds, Xiati ship counts are expected to double in the next year. Almost all colony worlds now feature potent Blaster type weapon platforms along with a complement of Pillager troops and Stinger fighters. To this point, the Xiati had been engaged in several combats with the EEE and Cue Cappa races. The destruction of Fezzran II had demonstrated the folly of colonizing planets without provided defenses in place beforehand. 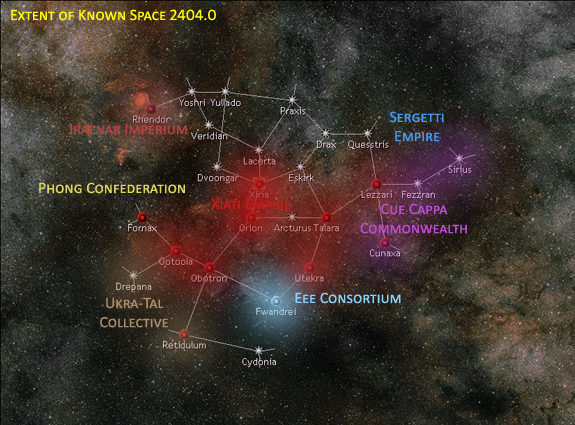 In 2405.1, the Cue Cappa launched a major attack on Lezzari I. The Cue Cappan fleet consisted of 2xFG, 2xDE, 2xLC and a support freighter. Lessons from the Fezzran II massacre learned, 3 DE (Raptor 0004; Phantoms 0003/0004) were in orbit and the surface had 4 Blaster WPs (2xTDB, 2xABM, 1xPDC) active. As the Cue Cappa approached, the 3 Xiati DEs remained in orbit of Lezzari I, remaining inside the offensive shell of the WPs. The Cue Cappan ships were struck with a volley of ABMs and a spattering of TDBs from multiple directions and exploded furiously. With only minor damage to the Raptor 0004, the battle was an overwhelming victory for the Xiati Empire. Emperor Tax'Renath declared war immediately after. The proximity of the EEE home system of Fwandrei has forced the Xiati to continuously blockade the two border WPs (Obotron-Fwandrei, Utekra-Fwandrei). The most serious attempt to run the blockade occurred in 2405.2 by an EEE LC. The LC was destroyed but did significant damage to the Forager 0004 and moderate damage to the DEs Raptor 0001 and Phantom 0001. In 2405.3, Emperor Tax'Renath was desperate to try and colonize the 3 oxygen planets in the Prot system (S of Reticulum IV) before the Ukra-Tal could claim the system. With colonizers several months away, Forager 0007[i] and [i]Forager 0008 were attempting to hold onto the target planets. When attacking a lone EEE repair freighter in Reticulum (warping through the unprotected Reticulum-Cydonia WP) the Phantom 0003 uncovered a significant EEE fleet (3xFG, DE, LC) moving towards Prot. By 2405.4, a Ukra-Tal colonizer had appeared in Prot and was going to colonize a planet within a month, which would claim the system for the Collective. Emperor Tax'Renath was trapped by the Ukra-Tal treaty and ordered the two Foragers back to Reticulum IV. In 2405.5, the EEE fleet clashed with the two Foragers and a Ukra-Tal DE at the Reticulum-Prot WP. Clearly overmatched the two Xiati ships (with a significant speed advantage) fled to the adjacent sector. The Ukra-Tal DE bought additional time and engaged the EEE fleet in a suicidal run. Emperor Tax'Renath noted the Ukra-Tal might be useful in deflected the EEE's attention. The two powers shared multiple borders in the far south. By 2406.0, the EEE had declared war on the Xiati Empire. Closely allied with the Cue Cappa, it was inevitable although the active WP blockade probably pushed them over the edge sooner. The large number of uncolonizable and empty systems to the north of the Xiati Empire was considered a significant area of risk. Without any infrastructure present the area was difficult to defend and few ships could be spared to secure the territory. Emperor Tax'Renath knew it was only a matter of time before the Jraenar, Sergetti and Norak would make there way south and threaten the Xiria system. The first stage of the new northern strategy was to develop the Palantir class satellite layer. The 500kT freighter could load up to 20 satellites, which could then be placed throughout the north to provide warning of alien ship movement. The Watcher class satellite featured basic sensors with some armor and a TDB (Temporal Distortion Burst) for protection. Palantir 0001 was launched in 2405.9. The second stage of the northern strategy was to develop new technology to allow for colonization of Gas Giant planets. Several of the northern systems did offer potential breathable Oxygen Gas Giants, which would provide the infrastructure needed to hold those systems. Unfortunately Xiati scientists estimate such technology may be 4-5 years off at best if all resources were directed to it. Emperor Tax'Renath needed options. With research into ship capture in 2405.1, the Xiati Empire now possessed means to capture enemy ships. In 2405.6, the Charger class DE was designed. The goal: capture the EEE's gas giant colonization technology. Charger 0001 and Charger 0002 were launched in 2405.9 and 2406.0. Both have been ordered towards EEE space. The push to colonize both the Prot and Vendrux systems (5 colonizable targets) plunged the Xiati economy into its second crisis. The Xiati ineptitude to harvest Organics (and the lack of organics in their space) had the stores low already - the draw of organics for colonization modules ran the them empty. Xiati Prime was forced to scrap Radioactives Extraction facilities for additional Organics farms. The successful colonization of Vendrux VII (ahead of the Ukra-Tal) provided a much needed boost. However, by this time a couple months construction had been interrupted. As a side note... this will be a difficult game if I stay in Xiati character. I'm currently 5/6th by score and heavily outproduced by most of the AI races more or less boxed in. Did I mention the EEE are already running around with PPBs and I have just Shields I? Yea, your starting position doesn't seem like the best, having enemies on all sides. Hooray for the walls of the galactic map! I think it would be suicidal to go for gas colonization right now, I don't know what PPB's are, but from your tech levels I feel you need to gain a couple to stay competetive. Maybe the "low" computer bonus is a little much, after all? I remember playing a couple games with this and being noticably outproduced, medium and hard boni would be a challenge. Maybe you could scale them down to provide a "real" difficulty setting. Of course, one or two games aren't enough to determine such, and I don't know how much you intentionally handicapped yourself to play as the Xiati would act. In 2406.5, Charger 0003 and Charger 0004 were ordered to transit the Obotron-Fwandrei warp point. It was assumed that one of the EEE's fleets that had threatened Obotron earlier would be present. As they emerged from the warp point, the two Chargers were indeed met with an EEE fleet (FG,3xDE,1xLC) but were able to run the blockade with their speed advantage and escape to the adjacent sector. In 2406.6, the two Chargers spotted a pair of EEE colonizers in orbit of the EEE colony on Fwandrei IIIa. Although the colony ship designs were unknown, the two Chargers attacked the colony sustaining minor damage from a small minefield. Combat scans indicated one colonizer had a rock module and the other a precious gas giant module. To make it complicated though, the Gas colonizer also had shields and two shield regenerators! Exploiting the weakness of the EEE captains, the two Chargers waited away from the WPs of Fwandrei IIIa and lured the colony ships out. A precision attack disabled the Rock colonizer, allowing the Chargers to use their TDBs against the shields of the Gas colonizer. Once the shields were taken out, boarding parties were launched and the Gas colonizer captured. After the ship was captured, there was still the problem of getting it to Obotron I so it could be analyzed. After all, Fwandrei was the home system of the EEE empire and multiple EEE combat ships were present in the system and a fleet was stationed at the warp point. The two Chargers and the captured ship moved in 2406.7 to a nearby storm sector to hang out. Next month, the EEE fleet had moved off the warp point and were heading towards the storm sector. With no ships on the WP, the two Chargers and their loot warped through and back to the Obotron system. On the other side, the Obotron Defense Fleet was there to provide protection until the captured colonizer could be moved safely. Finally in 2406.8, the captured ship arrived at Obotron I were it was analyzed by top Xiati engineers and scientists. Not only did the Xiati recover Gas Giant colonization technology, they gained improvements in shields as well. In late 2406.0, an EEE fleet (FG,DE,2xLC,3xMF) struck through the Obotron-Fwandrei warp point. 4 Xiati ships were present: Raptors 0001/0006/0008 and Phantom 0001. Unfortunately most of the Xiati firepower hit the EEE support ships first and the EEE combat ships tore through the Xiati ships. All hands were lost. 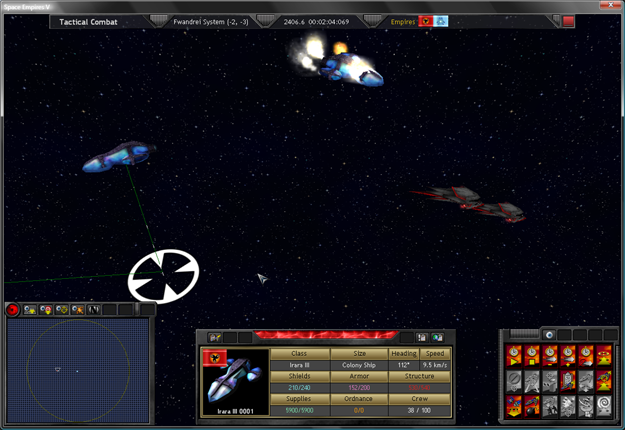 By 2406.1, two EEE fleets (the attacking fleet plus another) had broken into the Obotron system. Obotron I was heavily defended and escaped a direct assault. Fortunately one of the EEE fleets moved back to Fwandrei, but the second fleet seemed to head towards the Reticulum system before sensor contact was lost. The loss of 4 ships was fairly significant and the Xiati were stretched thin. Emperor Tax'renath's popularity was dropping quickly. In 2406.7, one of the EEE fleets re-appeared and attacked Reticulum IV. The planet had 4 Blaster WPs and a fleet of 3 Xiati DEs. Remaining close to the colony, the Xiati DEs combined their firepower and PD coverage with Reticulum IV and the EEE ships despite their advanced designs were easily destroyed. Revenge was had for the loss of 4 DEs at the Obotron WP. Luckily too, as one of EEE support freighters was carrying a full load of EEE troops. In 2406.8, the second battle of Obotron-Fwandrei WP started. The Obotron Defense Force (5 DEs: 4 Phantoms, 1 Raptor) had recently been assembled and were holding the warp point. The EEE fleet contained a FG, DE, 2 LCs and a MF. The battle was intense, but the Xiati force managed to destroy the ships with mostly a ranged attack. Phantom 0008 and Raptor 0008 were lost. After a bad start to the EEE war, a couple of victories and the capture of an EEE colony ship had raised Xiati spirits. As the war with the EEE went hot, the Cue Cappa were looking to strike the Xiati in the Lezzari system. Forager 0009 on a dangerous mission to scout Cue Cappa space had spotted a Cue Cappa fleet heading towards Lezzari (2xDE,2xLC) in 2406.4 from Fezzran. The Cue Cappa fleet after a skirmish with Charger 0002 at the Lezzari-Fezzran WP, finally struck the Lezzari I for the second time. At this point the fleet had added 4 MFs. In 2406.7, they attacked Lezzari I, which was defended by 4 Blaster WPs and 6 DEs (4 Phantoms, 1 Raptor, Charger and a squad of Stinger fighters). The Cue Cappa fleet was easily destroyed and the Stinger fighters were effective in tracking down the fleeing Cue Cappan support ships - including one full of invasion troops. Charger 0002 was even able to capture one of the freighters, which was good for scrap. 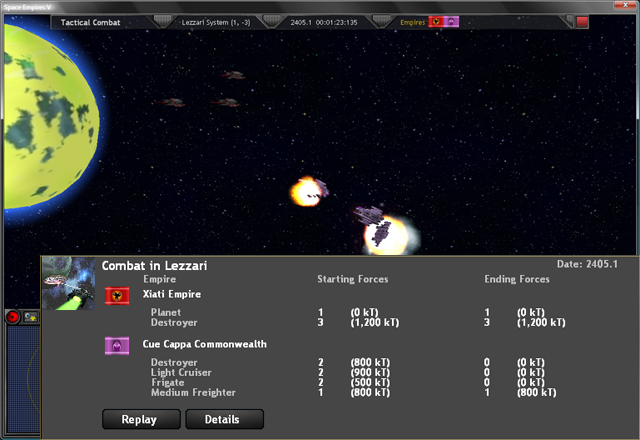 Immediately after in 2406.8, a second Cue Cappa fleet struck Lezzari I from the Cunaxa system (2xFG,2xDE,4xLC). Again, the Xiati defense forces stayed close to the planet and were able to destroy the invaders with only minor damage. In 2407.0, yet another Cue Cappa fleet (8 ships) had entered the Lezzari system from the undefended Cunaxa WP. The Battle of Lezzari I part 4? Forager 0009 has managed to survive so far in Cue Cappan space and has even managed to pick off a few Cue Cappan colony ships in the process. Also, it located the Cue Cappa HW in the Falcor system. With the turn around in the EEE and Cue Cappa conflicts and more importantly the acquisition of gas giant colonization technology, Emperor Tax'renath is pushing for a rapid push into the northern systems where several lush oxygen gas giants can be colonized. Palantir satellite layers have placed many observation satellites in the target systems and so far alien activity is light. With the first Gas Colonizer off the Xiati Prime space yards in 2407.0, it's full throttle ahead. In the southern systems, the Xiati have been pushing Forager class scouts into alien territory to gather active sensor information on EEE colonies and ship movements. So far, only one ship has been lost on this dangerous mission (to a minefield). The Xiati population is growing very slowly. Xiati scientists are looking for ways to get the Xiati to reproduce faster... but not much luck so far. 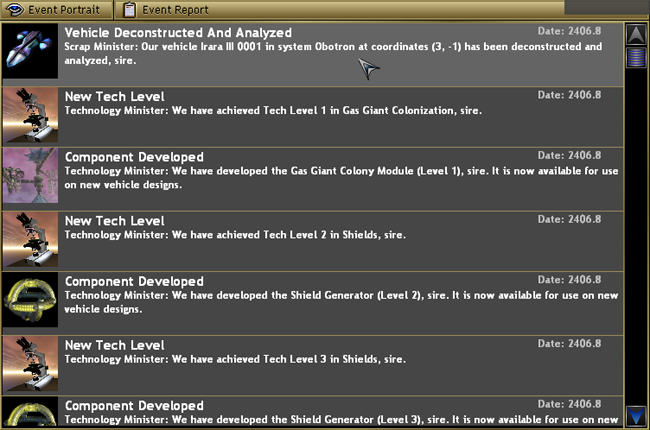 The colony ship capture was very difficult and I actually re-loaded the save a few times to get it right. 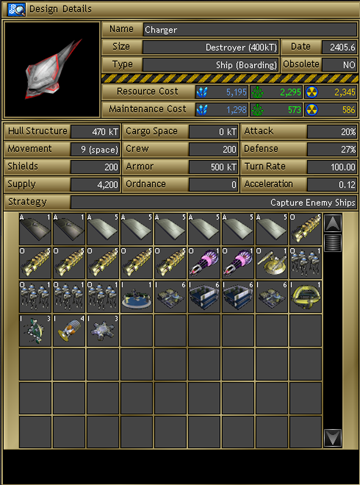 My decision to update AI colony ship designs to have shields and more importantly many shield regenerators came back to haunt me. The other problem was that there were two ships and I kept getting rammed some one or another trying to stay in TDB range to drain the shields prior to boarding. I also lucked out with the kamikaze AI strategy for colony ships as the EEE colony had multiple WPs with long range Plasma Missiles. 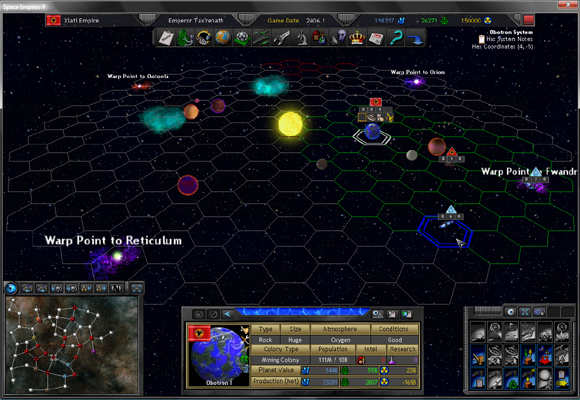 Adding the 6 or 7 Gas Giant planets in Xiati space will make a big difference and help support a good defense fleet. At this point, I see no solid way I can launch offensive attacks though. I wasn't going to use mines... but I think I will have to in order to gain some breathing space to build up. Unfortunately I'm far away from mines as I didn't pick up any levels nor the prereq in the starting tech selection. The next 10 turns will be interesting though. I know both the EEE and Cue Cappa out ship me at least 2:1. I only have the advantage of tactical combat... if I were playing simultaneous... I would be struggling much more.